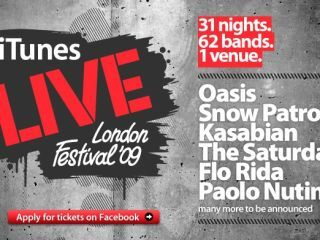 Apple's annual Camden-based rockfest, iTunes Live 2009, has been announced, with a number of major bands already announced for this coming July, including Oasis, Snow Patrol and Kasabian, The Saturdays, Flo Rida, Paolo Nutini and another 50 artists still to be announced. If you can't make the London Festival in person, then never fear, as Apple will be kind enough to sell you the recordings via iTunes immediately after each performance – because they are nice like that! Apple says this year it is "celebrating our 3rd anniversary in style" and "taking to the stage at Camden's Roundhouse will be Oasis, Snow Patrol, Kasabian, The Saturdays, Flo Rida, Paolo Nutini" with more announcements on the way. The trick is that you cannot BUY the tickets for the thirty gigs throughout July , but you have to apply for them via Facebook. It is a bit like Charlie and the Chocolate Factory but for Facebook-addicted indie-popsters instead of imaginary children. Apple will update the Facebook page with all the new line-up announcements and other festival related gubbins over the next month to keep the iTunes brand firmly in our brains.